Summer School "Chinese for Beginners" - eccspkus Webseite! Summer School "Chinese for Beginners"
Every August, together with the China Centrum Tübingen (CCT) we are organizing a Chinese Language Summer School for students of all subjects from Tübingen University. Updated information on this opportunity can be found on the website of the CCT, here. 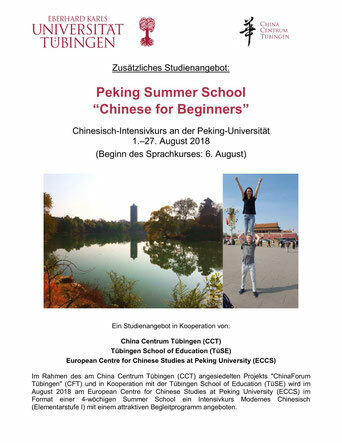 The ECCS Summer School "Chinese for Beginners", which aims at students of all subjects from Tübingen University and takes place between 1st and 27th August 2018 is open for application. For further information see this PDF file!